Posts containing Raspberry Pi related items. 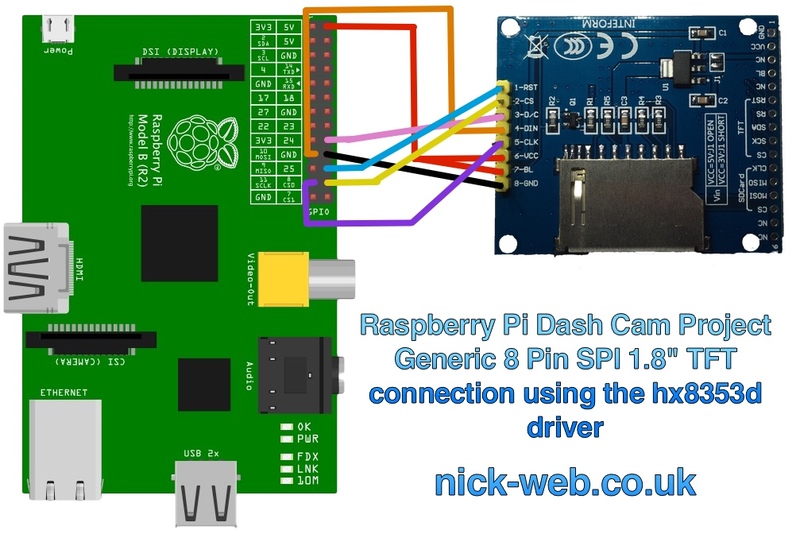 I’ve been toying with the idea of building a dash cam using a Raspberry Pi for a while. Every now and then I’ll buy something I think I’ll need for the project, hoping that I would get some time to work on it. I’ve had a few days holiday, and one of my aims was to at least build a prototype in the days I had off. I haven’t built a prototype, but I have the majority of parts together and verified that they worked! And it was surprisingly easy, apart from a 1.8″ Display (more on that later!). Firstly, why not just buy one? Because I think I can build this, and I think I can enhance it and add to it, especially if I splash out and buy a Raspberry Pi 2! Also, why not? My plan is to have the Raspberry Pi Camera Module recording as soon as the Pi boots to an acceptable state. A GPS receiver should then log the current GPS Position, heading and speed to a text file, and hopefully output some of that to a display. Likewise, an accelerometer and gyroscope should hopefully offer some additional readings to show the standard of driving.I plan to power the Pi via the cars 12v source (the accessory port or cigarette lighter). I will also have to create a safe power circuit so that once the vehicle has been switched off, the Pi shutdown gracefully. I will also have to make sure that when the vehicle starts there won’t be any sharp spikes in electricity which could fry the Pi. I have backed a BerryIMU, which has an accelerometer, gyroscope and magnetometer, which will connect over i2c, but that has still to be delivered. To mount the camera to the window, I purchased some suction pads (the ones with nuts) and I’ll create a custom camera mount to use them with. Yesterday and today I spent some time with the equipment I have to make sure it all works together, which, excluding the camera, it does! I’ve excluded the camera during this round of testing I want to get everything else working first. Heres the equipment, breadboard style. Please excuse the dust! The Pi was stuck behind my TV. Heres a quick video of the Pi being powered up in my car, using the equipment I already had to hand. Sorry about the black box, but this GPS Receiver is pretty accurate! Just now I’m running stock Raspbian, but I have also been playing with buildroot, specifically gamaral’s pre-built image. It really does boot that quick. Once I have everything set up in Raspbian, i’m hoping a few more days of compiling will get me a full featured Dash Cam that boots that quickly using buildroot. I’m hoping that the recording will start within 5 seconds of power being applied. All my goals for the system as pretty much listed above. I just have to start learning Python! Good think I backed another Kickstarter project! With regards to the 1.8″ Display, that was a bit harder to set up. I was under the impression the Display I had used a ST7735 driver, as everywhere online said thats what the display used. It doesn’t. It actually uses a HX8353 driver. There is some commands below. Each command is on a separate line and should be executed separately. One thing to note is that I hooked the Backlight directly to 5v, so the backlight is always on when power is applied to the screen. A case for my Raspberry Pi! Heres a quick 7 minute video about a case I purchased for the Raspberry Pi that only cost £4 from eBay!